Stuff Points: Earn 34 points when you buy this stuff. A high quality glass bowl for building your own fountain, or anything else. It comes equipped with a perfectly sized hole drilled into the side at one end, so you can easily direct an electrical cord through. It has a flat bottom that allows it to sit on any level surface, but you could also support it with any stand that's compatible. 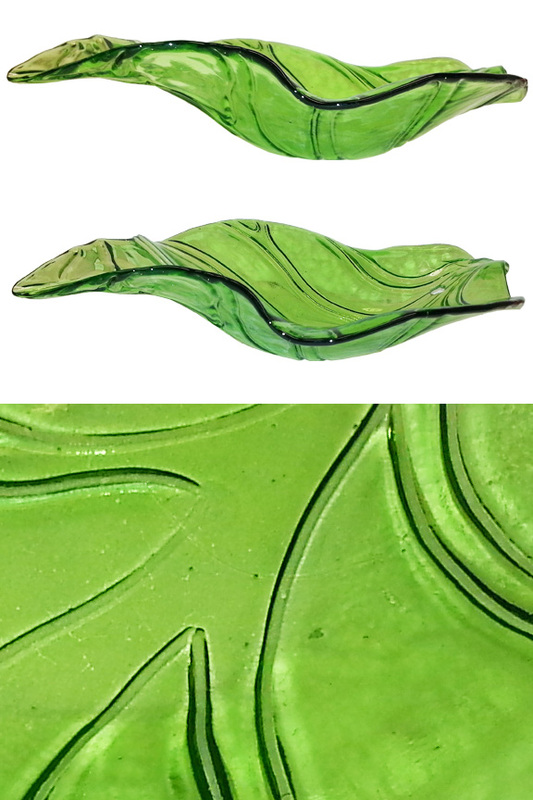 The whole thing features a translucent green coloring, and natural plant-like details that make it look authentic. It's several inches deep at the center, so it can hold plenty of water and other stuff in order to create a water feature with plenty of capacity. Simply place a mist maker at the bottom, add something else to prevent splashing, and you can easily create your own fountain that looks unlike any other. Because it's just a large fancy bowl, it can be used for other projects or uses too. The overall size is pretty big, and it's completely adaptable to your needs. 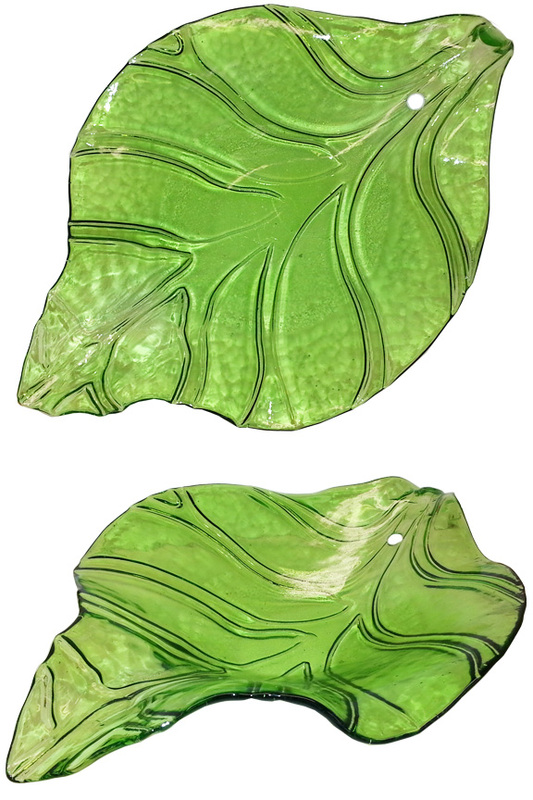 With an elegant shape that looks exactly like a leaf, this bowl is perfect for many uses, and easily transformed into an eye-catching decoration. Dimensions 24" x 16" x 6"
Hole Yes - pre-drilled at end to fit electrical cord. Compatibility Place on a stand or use directly on a flat surface. Styling Leaf shape with life-like plant detailing. A large capacity bowl that is useful for many purposes. Works great for building a unique looking fountain, but could be used for other stuff as well. Order Yours Today! I love the leaf bowl. I may have an older water leaf stand, unfortunately the hole was not in the right place (little too far down) for my stand. Also the color was a little lighter, but I do plan to use it, maybe make a few modifications. The placement of the hole and color has nothing to do the the service. It was shipped and arrived in one piece. Great customer service. Fine, Hard To Find, Product! Fast & Careful Shipping! Thank You!! I currently have a 17" bowl in a metal stand. Do you think this leaf bowl would sit securely in the stand? Hard to say for sure without looking, but yes, it probably would. My current mister needs to be fully submerged in water to work. How deep will the water be in the center if filled to capacity? It's not incredibly deep, but you'll be able to add plenty of water for submerging any mister you have. Is there another leaf design that is slightly different? I want to use this plate to build a 3 tier fountain so it would be nice they all dont look the same. Sorry. This is the only one we have at this time.